Difference between revisions of "LHD-069"
'''LHD-069''' is an uncontrollable [[military]] Landing Helicopter Dock featured in [[Grand Theft Auto: San Andreas]]. It is the first large-scale military ship to appear physically in a GTA game, and is docked at the [[Easter Basin Naval Station]] in [[Easter Basin]], [[San Fierro]]. '''LHD-069''' is an uncontrollable [[military]] amphibious assault ship featured in [[Grand Theft Auto: San Andreas]]. It is the first large-scale military ship to appear physically in a GTA game, and is docked at the [[Easter Basin Naval Station]] in [[Easter Basin]], [[San Fierro]]. LHD-069 is an uncontrollable military amphibious assault ship featured in Grand Theft Auto: San Andreas. 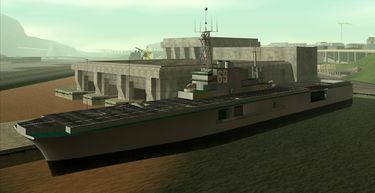 It is the first large-scale military ship to appear physically in a GTA game, and is docked at the Easter Basin Naval Station in Easter Basin, San Fierro. This page was last modified on 7 November 2013, at 20:33.